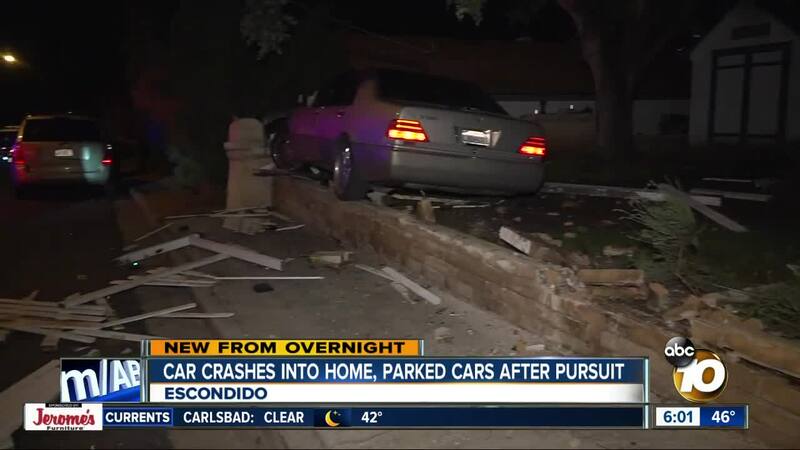 ESCONDIDO, Calif. (KGTV) - An argument in an Escondido neighborhood late Thursday evening led to the destruction of parked cars and the front fence and wall of a home. At around 11:30 p.m., Escondido police officers were called to the 700 block of Beacon Place in response to a possible domestic violence incident in the street. When officers arrived, they saw a man and three women arguing loudly inside a car. Officers tried to make contact, but the man sped away. However, as the driver tried to leave the area, he struck at least two parked cars and crashed into a fence and wall in front of a home. Two of the women inside the car suffered minor injuries and were taken to the hospital. A third woman was arrested on suspicion of being drunk in public and resisting arrest. Meanwhile, after the crash, the driver got out of the wrecked car and ran off. Officers found him a short time later hiding inside a garage he broke into on nearby Third Avenue. The driver was arrested on suspicion of felony hit-and-run with injuries and a parole violation.